Features the high-fidelity SHM-CD format (compatible with standard CD player) and the latest 24bit 192kHz remastering. The final recording by this edition of The Jazz Messengers (featuring trumpeter Lee Morgan, tenor saxophonist Wayne Shorter, pianist Bobby Timmons, bassist Jymie Merritt and drummer/leader Art Blakey) finds the group consolidating their year-and-a-half of experience into yet another exciting document. 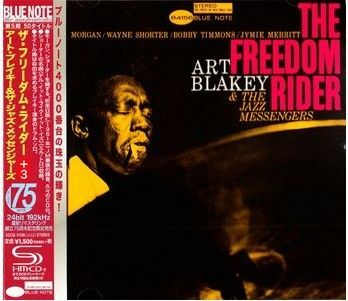 Blakey's unaccompanied drum feature on "The Freedom Rider" is full of drama while the rest of the program (two compositions apiece by Morgan and Shorter) makes this last chapter for this particular band quite memorable.